The role of cocktails on the silver screen is no great mystery. From James Bond’s famous Vesper to Nick and Nora Charles’ continuous stream of on-screen Martinis, some classic movies are defined by what the characters imbibe. But, it makes you wonder: What might celebrities drink off-screen? 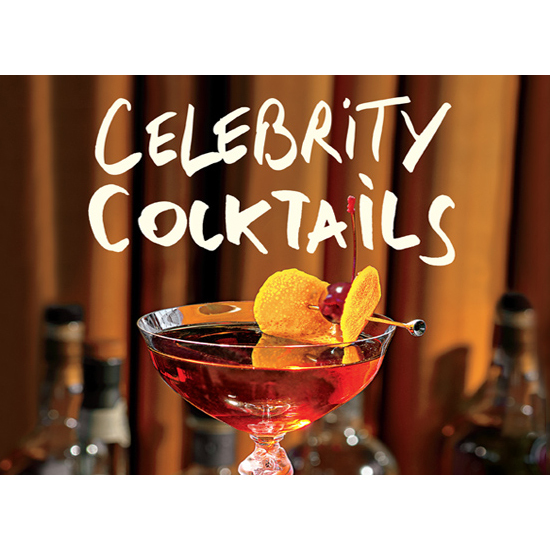 In his new book, Celebrity Cocktails ($50, Assouline), author and beverage consultant Brian Van Flandern celebrates some of the most well-known Hollywood talent through the art of mixology. “There has been a connection between the film industry and the cocktail since the early days of Hollywood,” he says in the book’s introduction. And it’s clear why after flipping through the book: Glamour, both then and now, goes hand-in-hand with elegant craft cocktails. It’s been that way since before the golden years of film. While not all of the drinks featured in his book reflect what celebrities order at the bar, Van Flandern’s inspiration does stem, in part, from having served celebrities like Kurt Russell and Goldie Hawn. Now, with Oscars on the horizon again, it’s fitting to celebrate the many Academy Award–winning stars featured in Van Flandern’s book. And you won’t need to look any further to turn your watch party into a glamorous affair. One of the greatest actresses of Hollywood’s golden age, Ingrid Bergman won three Academy Awards: for best supporting actress in Murder on the Orient Express (1975) and best lead actress for Anastasia (1957) and Gaslight (1945). One of her most well-known roles, though, was Ilsa Lund in Casablanca. Her character only drinks Champagne, so it’s understandable why Van Flandern’s Bergman-inspired cocktail has a bubbly base. Paired with passion fruit puree, simple syrup and Alizé, the drink is alluring and elegant—just like the lauded actress. Get the recipe. Clooney has been in the news a lot lately: His marriage to Amal Alamuddin; his partnership with friend Rande Gerber for Casamigos Tequila; his upcoming films. It’s easy to imagine what it would be like to hang out for a night with the booze-loving actor. Van Flandern’s tribute to the two-time Oscar-winner (for best supporting actor in 2005’s Syriana and best picture as a producer for 2013’s Argo) unsurprisingly uses Casamigos Tequila and is named for Clooney’s friendship with Gerber. The drink also uses Chartreuse, Cointreau and lime juice, which he says sounds like an unusual combination, but “they come together like old friends…who always have a good time.” Get the recipe. This cocktail isn’t just inspired by Liz Taylor, but based on what she called her favorite cocktail: “Hershey’s Syrup, vodka and Kahlúa.” Thus was born Van Flandern’s Taylored Black Russian. Curious how she thought up this odd combination? Well, that’s a question there may never be an answer to. It’s hard not to be enamored by the double Oscar winner (she landed best lead actress for both Who’s Afraid of Virginia Woolf in 1967 and BUtterfield 8 in 1961), we’re less sure about this drink. But if it was good enough for Liz, we’re willing to give it a shot. Get the recipe. Tasteful and understated: Not sure if we’re talking about the actor or the cocktail? This pairing seems natural, especially considering it’s made with a base of Old Grand-Dad Whiskey—the spirit preferred by Cooper’s character in the 1950 western Dallas. Two ounces of whiskey, one sugar cube and two dashes of Angostura Bitters is all you need to channel Coop. Add a lemon peel square for ultimate satisfaction. We’re sure the two-time winner for best leading actor in High Noon (1952) and Sergeant York (1941) would approve. Who woulda thunk that Robert De Niro likes his Martinis dirty? During Van Flandern’s stint bartending at top New York restaurant Per Se from 2004 to 2007, the actor would occasionally stop by for dinner and a drink with his wife. While she preferred Champagne, De Niro would always ask Van Flandern for two measures of vodka, one measure of olive brine—shaken and extra cold, of course—with three olives. We imagine that’s also how he celebrated his two Oscar wins, one for best supporting actor in 1974 for The Godfather II and another for best lead actor in 1980 for Raging Bull.